Citation DALEA CARNEA (Michaux) Poiret, var. GRACILIS (Nuttall) Barneby, Mem. New York Bot. Gard. 27: 256. 1977. Basionym: Petalostemon gracile Nuttall 1834. 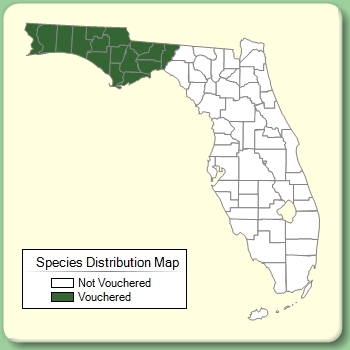 Type: FLORIDA: Without data, Ware s.n. (lectotype: PH). Lectotypified by D. B. Ward, Novon 14: 369. 2004. Dalea gracilis Dalea gracilis (Nuttall) D. B. Ward, Novon 14: 369. 2004, non Kunth 1819. BASIONYM: Petalostemon gracile Nuttall 1834. Dalea mountjoyae Dalea mountjoyae M. Woods, Phytoneuron 2013(23): 1. 2013. 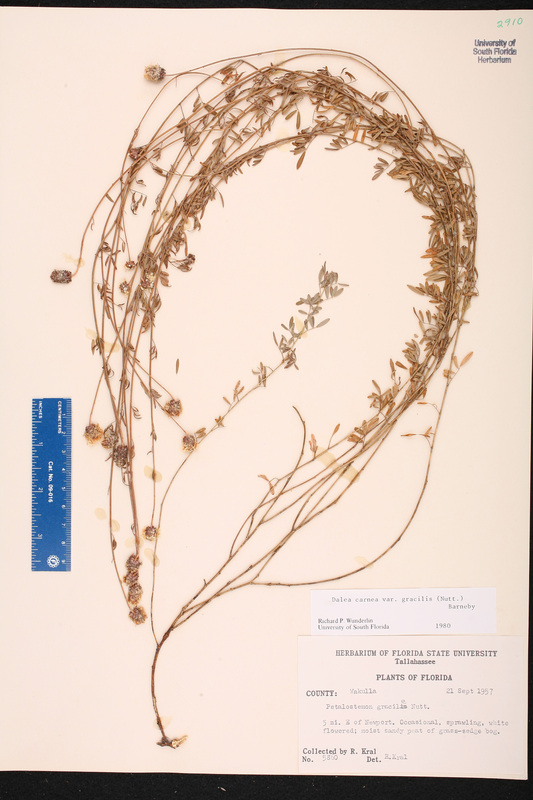 BASIONYM: Dalea gracilis (Nuttall) D. B. Ward 2004, non Kunth 1819; Petalostemon gracile Nuttall 1834. 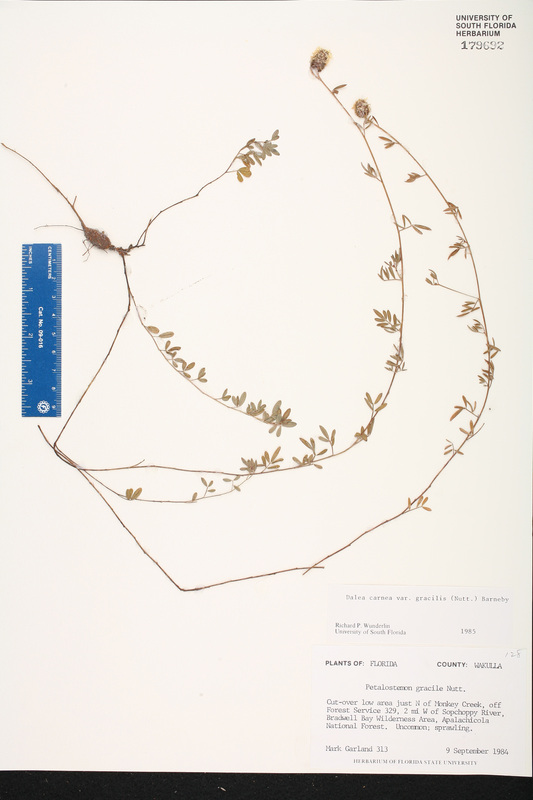 Kuhnistera gracilis Kuhnistera gracilis (Nuttall) Kuntze, Revis. Gen. Pl. 1: 192. 1891. BASIONYM: Petalostemon gracile Nuttall 1834. 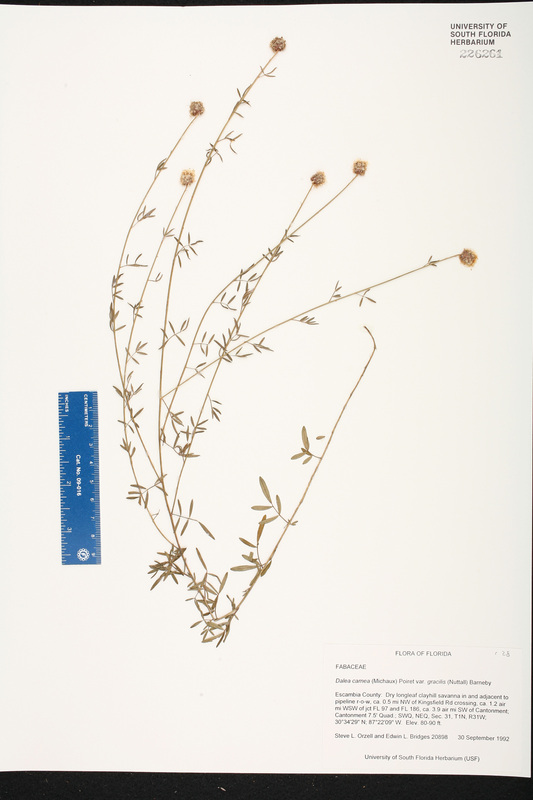 Petalostemon gracile Petalostemon gracile Nuttall, J. Acad. Nat. Sci. Philadelphia 7: 92. 1834. TYPE: FLORIDA: Without data, Ware s.n. (lectotype: PH). Lectotypified by D. B. Ward, Novon 14: 369. 2004. Petalostemon bicolor Petalostemon bicolor Bertoloni, Misc. Bot. 9: 9. 1850; Mem. Reale Accad. Sci. Ist. Bologna 2: 273, t. 13(1). 1850. TYPE: ALABAMA: Without data, Gates (?) s.n. (holotype: BOLO? ; isotype (? ): NY).